There’s nothing in the world quite like gifting a beloved book to a younger reader, and there’s nothing quite like embarking on the journey that is Harry Potter. For the generation who first grew up with the Hogwarts gang, the time has come to initiate a whole new class of Gryffindors, Hufflepuffs, Ravenclaws, and yes, even Slytherins. And since Harry Potter is no ordinary series, fans have started a characteristically offbeat, impassioned, and heartfelt method of welcoming the freshman class. 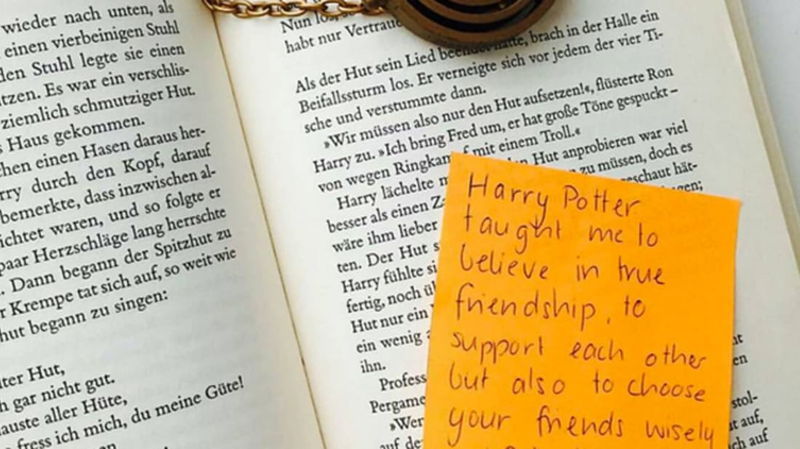 A Tumblr post from MuggleNet has started #PotterItForward, in which fans of the series surreptitiously tuck notes in the pages of Harry Potter books at stores and libraries to be found later by those on the adventure for the first time. The gist of the notes? It’s up to the writer of course, but generally they touch on how Potter affected their lives and what the stories mean to them. As for J.K. Rowling herself—the author has yet to comment on the hashtag, but it seems inevitable considering her well-maintained Twitter account. Not to mention the fact that we happen to know she’s a woman who likes some Mischief Managed.